Over the last two decades, Susannah Wellford founded two organizations designed to raise the political voice of young women in America. In spring 2007, Susannah founded Running Start to inspire young women and girls to pursue political leadership. Running Start furthers the work begun by the Women Under Forty Political Action Committee (WUFPAC), which Susannah cofounded in 1999 and led for five years. Susannah speaks frequently around the country about the importance of involving more young women in politics. She has also lectured about politics to international groups from dozens of countries. She was invited to Kuwait by their government in spring 2006 to meet Kuwait’s first women candidates and to advise them on their campaigns and has been sent by the State Department to speak in the Maldives, Sri Lanka, Israel, Belgium, Ukraine, Algeria, and Russia. Susannah was recently selected to participate in the Joint Civilian Orientation Course (JCOC), the oldest and most prestigious public liaison program in the United States Department of Defense. 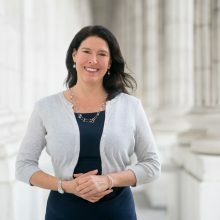 After receiving her JD from the University of Virginia School of Law in 1998, Susannah worked for several years at Verner, Liipfert, Bernhard, McPherson & Hand, lobbying for state and local governments, foreign governments, corporate entities and trade associations before Congress and the Executive Branch. Prior to law school, Susannah worked for Hillary Clinton’s Health Care Task Force in the Clinton White House. As a member of the Health Care War Room staff, she planned and executed grass-roots health care events for the President and First Lady and coordinated speaking events for Congressional Members and White House staff on health care reform issues. She is also a former Legislative Assistant for Senator Wyche Fowler from Georgia and a proud 1990 graduate of Davidson College. Susannah lives in Washington, D.C.